PacketGen™ Software Ver 14.8.21 | Download Now! PacketGen™ is a PC-based real-time VoIP bulk call generator (including both SIP signaling and RTP generation) for stress testing and precise analysis of the VoIP network equipment. PacketGen™ is based on a distributed architecture, with SIP and RTP software cores modularly stacked in one or many PCs to create a scalable high capacity test system capable of generating more than 2000 simultaneous calls. 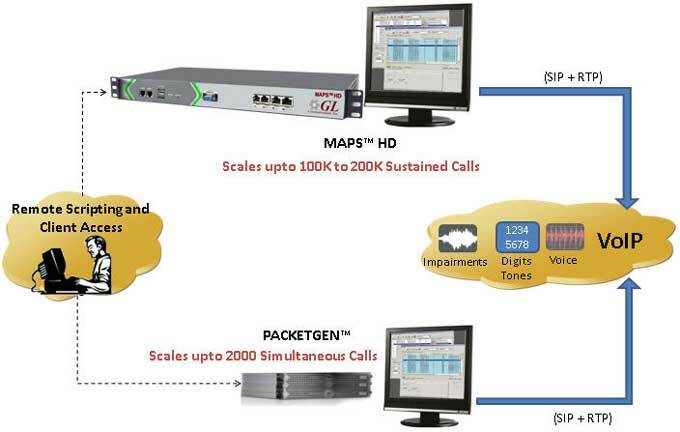 PacketGen™ on an i7 PC can support 2000 simultaneous calls with, both SIP and RTP generation. This performance number is associated with using the G.711 codec, while other codecs may provide higher call densities. PacketGen™'s distributed architecture allows achieving higher call density by interconnecting more number of systems with SIP and RTP software cores. GL provides PacketScan™ HD (PKV120) for High Density IP Traffic Analysis w/ 4x1GigE Network Monitoring and PacketScan™ FB (PKV121), a File Based IP Traffic Analyzer Server for near real-time processing of traces. GL also offers MAPS™ SIP & MAPS™ SIP HD for advanced SIP/RTP bulk call generation with traffic. It is available as special purpose 2U network appliance that is capable of high call intensity (hundreds of calls/sec) and high volume of sustained calls (tens of thousands of simultaneous calls). MAPS™ HD network appliance is designed to easily achieve 4 to 20,000 endpoints per server. Using a stack of multiple servers, a larger test system with 100K-200K calls (all controlled from a single Master Controller) is achievable for enterprise to carrier grade testing. The network appliance performs signalling and traffic generation for a vast array of communication protocols covering IP and Wireless networks. It supports simulation of SIP UA, IMS SIP UE, SIP I+T, SIGTRAN, IuCS, MGCP, NCS, H.248/Megaco, Cisco SCCP (Skinny), Clear Channel (No Call Control) and provides non-reference-based voice quality using E-model (R-factor) and MOS with five mapping scales. Up to 20 SipCores can be run on the same PC or on multiple PC systems. All 20 SipCores can be remotely controlled from a single system. Supports run-time parameters to control call and traffic behavior – SIP Call Parameters (timers, Reliable Provisional Response, RTP Source, Packetization time for packets in RTP traffic, Control sending/ detecting of Outband digit codec, Receive Jitter Buffer, Authentication of incoming calls, and more) and Digit Generation and Detection parameters (power, on/off, pause, and amplitude). EVRC-C is not supported in PacketGen™. *AMR, EVRC, EVRC B require additional licenses. GL’s Audio File Conversion Utility (Audio FCU) is used in conjunction with GL’s packet products to automatically convert any voice file with different codec, into *.glw file format and vice versa, during send and record voice functions. GL’s Audio Stream Utility is used to playback the selected calls from a remote computer to the speaker on the local client PC. PacketGen™ is compliant to the UAC, UAS, Registrant and Redirect Server as per the RFC 3261 (SIP) along with backward compatibility of SIP RFC 2543 and RFC 3262 (Reliable Provisional Response). The SIP setup screen controls the foundation of the desired test environment. The user has the flexibility to configure multiple SIP and RTP instances on a local system and/or remote systems. Each SIP and RTP instance provides additional call density capabilities, thus allowing a true distributed architecture. The RTP portion is available as either software or hardware. In addition, true RTP Load sharing is provided within PacketGen™. SIP Parameters – Allows user to set certain SIP/SDP headers for outgoing messages. User can set UA Name, Host Name, Port, Sip Server Address, NAT option, and multiple contact entries for each UA. Media Parameters – Allows user to set the RTP media parameters (RTP) for the User Agent. These parameters indicate the media capabilities of the User Agent. These are used to negotiate media characteristics of the call during call establishment. Extra Headers – Configures extra SIP/SDP headers to be used for each User Agent. These headers are non-critical headers, and will be included as is, in the appropriate messages sent for this User Agent. UAC Authentication – Configures the user authentication information required for UAC simulation. Quick Configuration Utility - Multiple User Agents can be quickly created using any one User Agent as a reference. Current Status of each configured session - Status of each configured call such as Dial and HangUp are displayed. Call Processing Options including Hold and Call Transfer - The user can place the call on hold and can transfer the call to a third party by entering the IP address using either UDP or TCP method. PacketGen™ provides facility to register a single or a bunch of User Agents simultaneously. Each Registration gives flexible configuration options like Registrar server address, Address of Record, Expiry time etc. Also, each Registration can be configured for automatic registration refresh, after the existing registration expires. A quick configuration utility helps to configure hundreds of registrations easily. This feature provides a quick and easy method to configure signaling actions, to be performed automatically as soon as the call session is established. Configuration is based on call sessions, thus each call may be configured for unique activities. Signaling options include Call Transfer, Call Reject (User-Defined Error), Hold and Re-Direct. Send Actions – Send GL Proprietary voice files, PCM u-Law or A-Law, GSM, G.729A/B, G.726; Send DTMF or MF Digits (In-band or Out-Band); Send user-defined single/ dual Frequency tones; Send real time voice from default audio device (microphone). Loop Back – Loopback real-time voice traffic from the received RTP/RTCP to the send RTP/RTCP (all received traffic will be re-generated as send traffic). Receive Actions - Record received voice file in GL Propriety file format; Detect incoming single/dual Frequency Tones and DTMF/MF Digits from in-band received voice; Play received voice to default audio device (speaker). Power Measurement – Shows an active receive signal level in dBm. Auto-Action feature provides a quick and easy method to configure signaling as well as traffic actions, once the call session is established. Configuration is call session based, thus each call may be configured for unique activities. Traffic options include transmit / record voice, generate / detect tones, digits and noise and send / receive fax. Advanced traffic options like codec parameters, ptime and Rx jitter buffer control are provided. The existing "Playback" feature is used to play the selected call to speaker on the local computer (SIP/RTP core). To allow these calls to be heard from remote systems, GL has introduced Audio Stream Utility with PacketGen™. This utility automatically streams the voice of a selected call to a speaker on a remote system. PacketGen™ provides a powerful scripting capability to control RTP traffic. Scripting features includes loops, conditional statements, wait for events, timers etc., Scripting gives the user greater control over the RTP traffic being generated allowing users to create/test IVR kind of applications. Scripts can be created using the RTP Script Editor, which allows an intuitive, point and click script setup. The set of script elements included in the script editor allows user to perform all the traffic generation / reception actions as done using PacketGen™'s main graphical user interface. Script Editor has been enhanced with a Monitor Tone option that helps the user to detect single/dual frequency tones. The NAT Address option has also been modified so that the PacketGen™ is configured to send only NAT Address in a contact header while sending any request. PacketGen™ can be used to establish calls and send/record voice files through the IP network. These voice files are then analyzed using GL’s Voice Quality Testing (VQT) application as per ITU algorithms. Voice Quality testing can be completely automated using PacketGen™ CLI, RTP Action scripting, along with GL's ASR Listener, FCU and VQT software. PacketGen™ is one of the platforms for transporting voice in GL's comprehensive Voice Quality Testing (VQT) solutions. For more details, click here for complete Voice Quality Testing information. PacketGen™ now transmits and records voice files using a GL proprietary file format (.glw). The accompanying GL Audio File Converter Utility (AFC) will automatically convert any voice file, encoded as G.711, G.729ab, G.726, or GSM, into *.glw file format and vice versa. This allows the ability to send/receive voice files at a higher density with multiple codecs (the file is predefined with the desired codec). It also allows for Discontinuous Transmission/Reception. PacketGen™ provides detailed statistics for each User Agent, SipCore as well as for the entire system. Included in the statistics are complete/incomplete calls, failed calls (based on user-defined thresholds) and type of generated traffic. Call Statistics window provide detailed call wise statistics per SipCore. System statistics window provides the overall call statistics such as active calls in progress, completed calls, number of successful calls, attempted calls, and so on for each SipCore. All events and statistics can be exported and saved for record or review at a later time. In addition to the GUI, PacketGen™ can also be operated through a Command Line Interface (CLI). All the functionalities of the PacketGen™ GUI are supported, except the configuration functions. Users can thus operate PacketGen™ from a DOS based console (instead of the GUI) or easily integrate PacketGen™ into their own applications. PacketGen™ provides user customizable .ini files to suit the testing requirements. The .INI file is read once by the RtpCore on startup and will be applicable as long as RtpCore runs. RTCP_XRConfig.ini - PacketGen™ handles signaling negotiation (as per RFC 3611) for RTCP-XR attributes through SDP in "RTCP_XRConfig.ini" file. Provides options to disbale/enable RTCP packet transmission, and Digit detection qualification time and power.